This is David Bowie's last official live recording, and what a great show it is. Performed before an enthusiastic crowd in Dublin, you get a two hour plus set of Bowie classics mixed with his contemporary material, all played by Bowie's superb band. The man himself is on fine form, sounding and looking healthy after a period of poor health and absence from the live concert circuit. Nobody had expected this tour and it was a really enjoyable, exhilarating surprise. Occasionally, in his between songs chat, Bowie appears to speak in an affected Irish accent, which is somewhat odd, however. Listen to it - he really does, to be sure. The set kicks off with an energetic "Rebel Rebel" and you can feel (and hear) the crowd's excitement. The band crank it up and the sound is thumpingly big and bassy, which I love. There is a palpable "live" feeling right from the start on this release. It is actually on of Bowie's finest ever live recordings. What a shame it was to be his last. The more contemporary material is played with a vigorous and vitality of an artist and band enjoying something new. "New Killer Star" is a great example. Classic Bowie songs interjected through the set are a superb, pulsating, bassy "Fame"; a welcome outing for "All The Young Dudes" (the crowd, incidentally, I am sure, cheer because they are expecting "Young Americans" from the introductory drum roll, just before it goes into the iconic guitar intro to "Dudes"); "Be My Wife"; an even more welcome and wonderful version of "The Man Who Sold The World"; "Fantastic Voyage" from "Lodger"; a most evocative "Life On Mars"; "Ashes To Ashes"; the most underrated "Loving the Alien"; "Changes"; an atmospheric "Heroes" and the "Ziggy" closers of "Five Years", "Hang On To Yourself" and "Ziggy Stardust". Right at the end, "Breaking Glass" from "Low" appears, and the whole thing ends with "China Girl". I like the way that every few songs, along some a classic. So he avoids losing people's interest with newer songs, but also doesn't turn it into a "greatest hits" thing either. It is a nicely balanced set. The more modern material is, as I said earlier, very impressive. 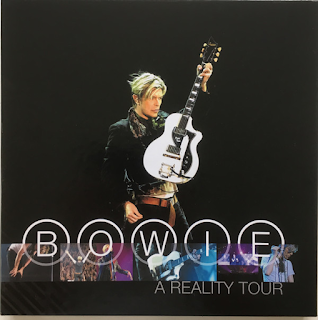 "Reality", "I'm Afraid Of Americans" and a rousing "Never Get Old" are highlights, as is the guitar riff-driven, muscular Pixies cover, "Cactus". Another great moment is "Under Pressure" with Gail Ann Dorsey supplying the iconic bass line perfectly. The comparative rarity, Iggy Pop and Bowie's "Sister Midnight", is delivered superbly, full of great bass, drums and lead guitar. Check out the guitar on "Afraid" as well. Quality all over the album. The whole album is a pleasure to listen to (and watch on the DVD too).